While health conscious consumers are beginning to demand healthy, plant-based food around the globe, processed food and fast food establishments in Asia still serve an eager consumer base. Plant-based meals are not hard to find in the old city of Chiang Mai, Thailand, which is frequented by many backpackers and travelers. 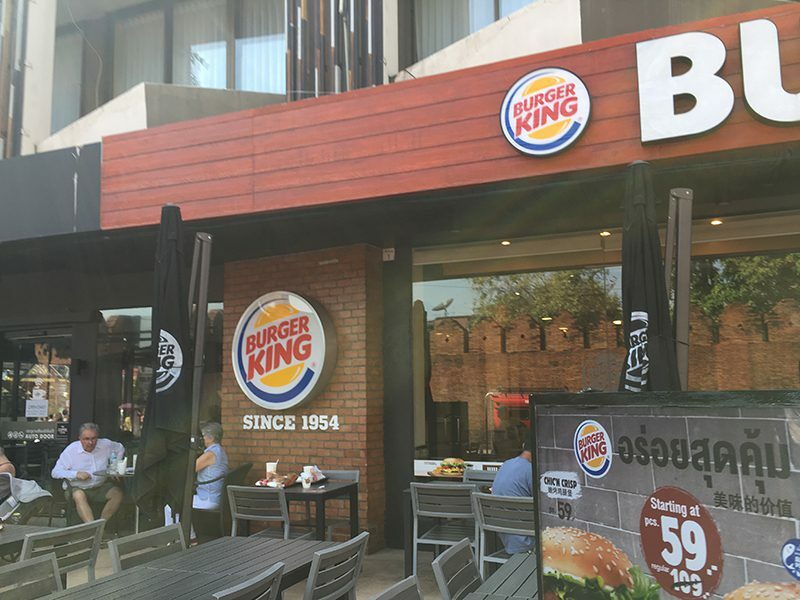 However, just outside the moat that encloses the old city, you can find multinational fast food chains as well as Thai restaurants that serve significant amounts of fish, chicken, pork, and some beef. You can click through the following photos below, which were taken by Brighter Green colleague Judy Bankman throughout the city of Chiang Mai and at Hong Kong International Airport, where Bankman flew through while getting to Thailand from the U.S.
A Thai restaurant advertises “top quality beef noodles” in English. Judy Bankman is a public health professional and consultant with Brighter Green. In 2017 Brighter Green published the discussion paper, “Chronic Disease, Changing Diets and Sustainability,” which Bankman wrote and researched. Her work has also been published by The New Food Economy, Civil Eats, Food Tank, The Food Climate Research Network (FCRN), and China Dialogue. A recent post published on the FCRN blog called “Changing diets threaten public health & the environment” can be found here. She is interested in the intersection of public health and food systems and holds a Master of Public Health from New York University’s College of Global Public Health.